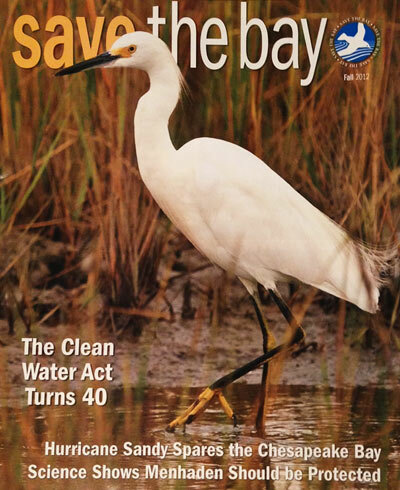 The current issue of Save the Bay magazine - the Chesapeake Bay Foundation’s quarterly publication, features a photo of a snowy egret (Egretta thula) I captured on Hoopers Island, near Blackwater National Wildlife Refuge. Snowy egrets, common to North America and found along the Atlantic and Gulf Coasts from Maine to Texas (and inland along major rivers and lakes), feed on small fish, frogs and crustaceans. They are one of the many beautiful wading birds found along the shores of the Chesapeake. Learn more about the snowy egret. Thanks to the Foundation for featuring my photo. They continue to do great things for the Chesapeake - from education to advocacy. Learn more about the Chesapeake Bay Foundation and this outstanding publication.